As Sundar Pichai, Google’s CEO says, “A diverse mix of voices leads to better discussions, decisions, and outcomes for everyone.” That’s especially significant in tech companies who aim to drive innovation. 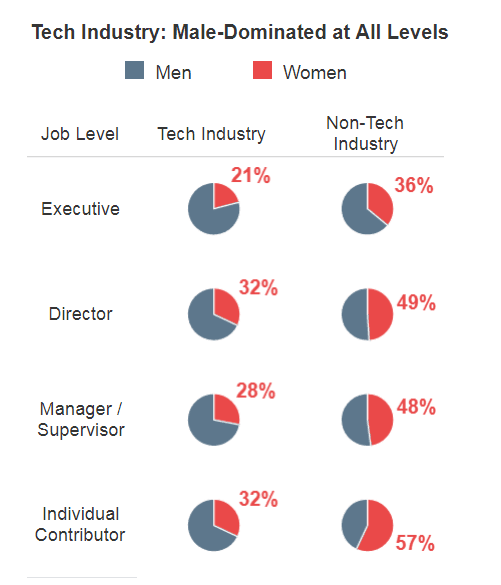 That said, women in tech remain underrepresented both in startups, SMEs, and corporations globally. In this post, we will present the 10 steps you need to take to hire more women in tech. growing the way technology companies typically do by hiring a lot of white and Asian men. One of the executives penned a manifesto that pledged Slack would hire as many people from diverse experiences and backgrounds as it could. This proves even companies who focus on diversity early on and make a conscious effort to diversify struggle to do so. 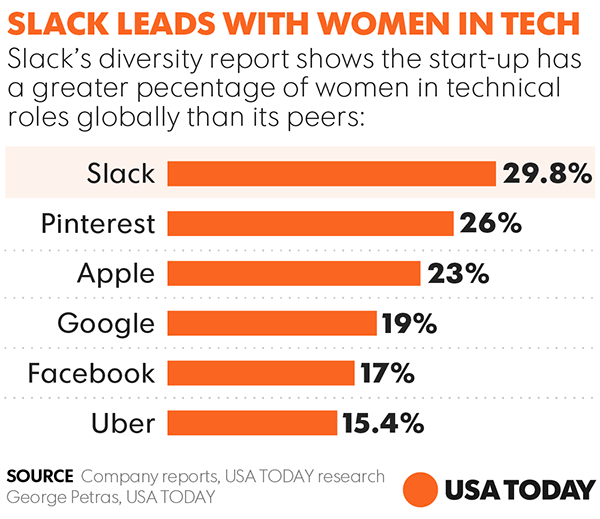 The way Slack reached the top of the “women in tech” list is with a conscious, pre-planned effort. 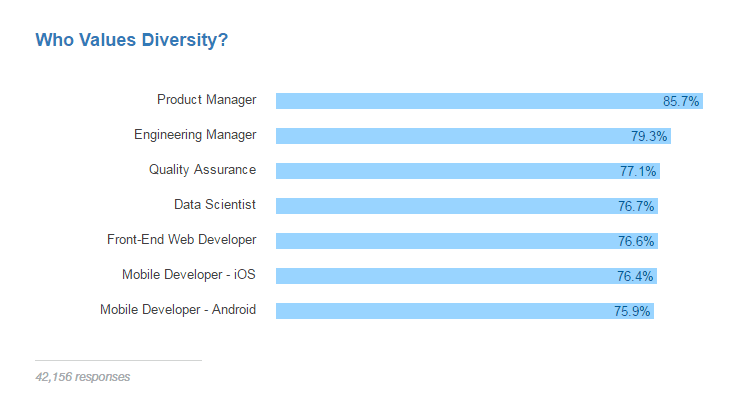 Do developers want gender diversity? PRODUCTIVITY: A Massachusetts Institute of Technology and George Washington University study reveals that employees tend to be happier when they work with people of the same gender, but are generally more productive when they work in a nonhomogeneous environment. CREATIVITY: Nonhomogenous teams stimulate the brain because they tend to challenge stale ways of thinking. Due to what the psychologists call fluency heuristic, humans tend to favor information that can be processed easily or they already know, which they believe to be true or more beautiful (that’s why certain songs or slogans grow on you after you hear them a couple of times). When you step out of what you already know, you’re most likely to achieve growth. Of course, correlation doesn’t equal causation, so you can’t just hire any woman who applies and expect to achieve growth – you still need to monitor QoH (Quality of Hire). “Greater gender and ethnic diversity in corporate leadership doesn’t automatically translate into more profit), the correlation does indicate that when companies commit themselves to diverse leadership, they are more successful.” One of the reasons is that women in tech are probably more drawn to diverse teams where they get work with both male and female colleagues. In the 2016 Developer Landscape survey by Stack Overflow, 73% of developers said gender diversity was “at least somewhat important in the workplace” and 41% of them said it was very important. Software engineers who influence hiring decisions were most likely to believe in the importance of diversity in comparison to other developers. Results of the 2016 Developer Landscape survey by Stack Overflow show just how male the software development world is, with a staggering 92.8% of survey participants identifying as men. However, this statistic underrepresents women in tech and Stack Overflow staff say their internal data suggests the imbalance isn’t as severe. However, in the majority of “programming teams, men outnumber women often by significant margin”. The results suggest that despite being more competent overall, women on GitHub are subject to a strong bias. As a tech recruiter, your job is to fill positions quickly and efficiently. Sadly, issues like diversity are often deemed less important than metrics such as speed of hire. hiring the best person and hiring the best team which studies show is a diverse team is not necessary always opposite. You’re not hiring in isolation. Building a team is like taking raw blocks and trying to put them together in a way that makes the strongest structure, and if you have all the blocks that are leaning one way that you just stack on top of each other, eventually that tower is going to fall over. If the team you’re hiring for is predominantly male (so all the blocks lean one way, as Stock would say) but you want to bring change to your structure, here are the 10 steps you need to take to attract women in tech. It’s taken by all new hires during orientation at Google and Google is right to do so. It’s time you followed suit. It’s one of the first places people go to work out what kind of an employee you are. As Leigha Mitchell says, “if it’s plastered with pictures of white guys in flannel with beards, that’s a red flag.” Mitchell says if that’s the case, the page should include a statement explaining that you want to diversify and why you want to do it. She adds that another frequently used trick she’s seen is including an outline of a female silhouette with a caption “This could be you!”. Mitchell also recommends involving women in the interview process, especially when talking to female candidates. This makes them more at ease when it comes to asking certain questions which can only be answered by other women in tech. She suggests that if there are no women on the team you’re recruiting for, it’s a good idea to “bring someone from another team for a culture interview”. 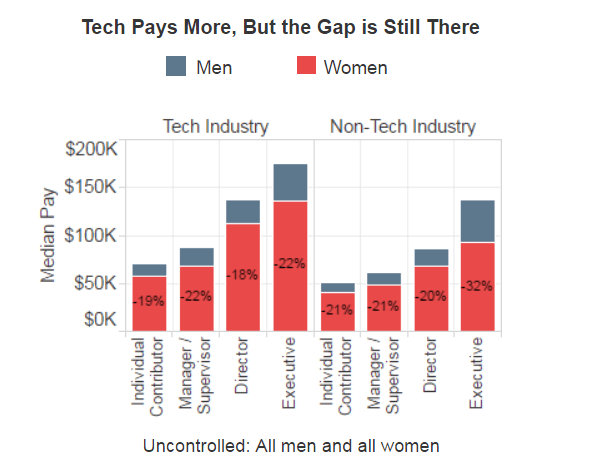 According to PayScale, gender pay gap in tech is lower than that of non-tech industry. However, there’s still a lot of work to be done. As you can see, the gender pay gap gets bigger as people move into more senior roles. The gender pay gap gets bigger as people move into more senior roles in this group, too. 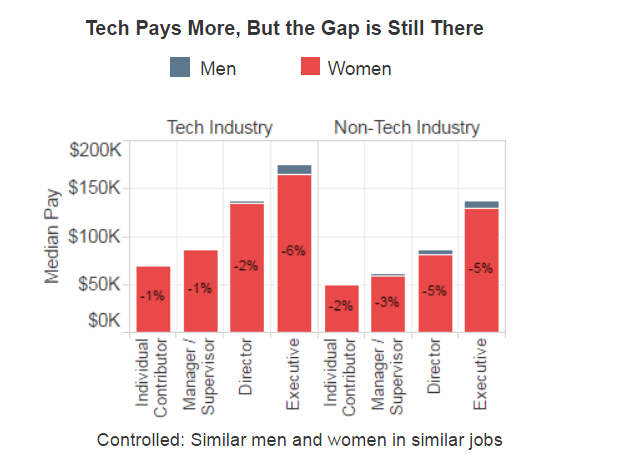 For example, the gap for similar men and women in similar jobs in the tech industry goes from -1% for Individual Contributors to -6% for Executives. Male Median Pay for Individual Contributors is $70,900 and Female Median Pay for the same job equals $70,000. For executive jobs in tech, Male Median Pay and Female Median Pay equal $174,600 and $164,800 respectively. As Molly Koernke says, “salary transparency evens the playing field for women”. A Harvard University study “Social incentives for gender differences in the propensity to initiate negotiations: Sometimes it does hurt to ask” shows that women get penalized more than men when initiating salary negotiations, even by female evaluators “assessing willingness to work with a candidate from written transcripts”. Keep that in mind next time someone tries to negotiate pay and devise a comfortable environment for discussing salaries and policies. – When answering math problems, girls tend to raise their hands less frequently than boys, even though they are more accurate in their answers when they finally decide to speak. – Women are more reluctant than men to offer their ideas in business meetings even though they are often better than many offered by their male colleagues (as evaluated by observers). Eustace followed them with a statement that it was time for to apply for promotions, and as you can expect, the application rate of female engineers soared. He sent the email a number of times and it had the exact same effect. When he did forget to send it out, the number of female applicants dropped sharply. Encourage women in tech to take action, but do it tactfully. Present data to make them feel more comfortable, but don’t go overboard. “Increasing diversity at the entry level is not enough because these “diverse” people are not likely to stick around.” Paolo Gaudiano and Ellen Hunt point out that when new hires realize that their managers and executives “look nothing like them”, they are likely to jump ship. They also state that new diverse hires are prone to prejudice because the working environment they’ve joined is stale. Finally, they suggest that homogenous leadership may not offer basic benefits which are important for “diverse people”, like private space for lactating mothers. As a woman in tech, I’d like to leave you with this powerful quote by Leigha Mitchell: “I should forget that I’m a minority, but be supported when I remember”. This hits home big time because we all want to be valued and treated equally. Sanni Oluwatoyin Yetunde, a software developer at Andela has a good point, too: “Overall, to become a female developer, you only have to do what any other smart dev would do. Spend weekends and late nights in front of your computer, laying down lines of code, debugging and developing your personal projects. Follow tutorials, read articles, and learn on the fly. Master the lingo. And, if you are curious enough to go deep down to the core of what you are trying to build, you will need to acquire a large and useful understanding of computer science. In a nutshell, spend time to learn all you can.” Dear recruiters, please don’t underestimate the hard work of any developer, male or female. “As Sundar Pichai, Google’s CEO says, “A diverse mix of voices leads to better discussions, decisions, and outcomes for everyone.” That’s especially significant in tech companies who aim to drive innovation”. And where exactly is the proof of it? Significantly less diverse German. Korean or Japanese companies seem to be doing better than American counterparts in many areas of technology. If you look through a couple of reports on diversity you’ll see that diversity increases the likelihood for the company to be more successful, in term of money, productivity and creativity. The research took into account companies across a range of industries, so not only tech companies. As far as your statement is concerned “Significantly less diverse German. Korean or Japanese companies seem to be doing better than American counterparts in many areas of technology.” – I haven’t come any research that would support or deny this opinion. Still, diversity it’s a company’s call in the end. “Research” especially in social sciences is usually producing output that the researcher is looking for. Your statement does not stands test or real life. Anyone buying products on the market can easily see that highly engineered Japanese, Korean or German made products are usually far better than equivalents made by significantly more diverse US companies. If you want research on this subject just buy the next issue of Consumer Reports.